This post is so long overdue, but today, excited to share a little “insider look” at a few key decisions we made in this kitchen to save big money and to boost functionality in this space. Our kitchen has been officially finished for a few months now and I have to say, we are loving it so much. I said it in the reveal and it’s still true. It’s my favorite space I’ve ever designed….for many reasons design and beyond! When we first decided not to add on to this house and to use the existing 1100 square feet for a season to save, I was most worried about the kitchen. It was so closed off before, very poorly designed, and really tight. I knew we could make it better with a lot of re-configuring, but I was still skeptical that we could really overcome all the obstacles this space had. And after a lot of brainstorming and trial and error with layout and design, it’s perfectly functional for us. There’s nothing I would change. You can read more details about the why’s and what we did layout-wise in the progress post. Once we knew the structure of the room, we set out to find ways to save while maximizing the look and function we wanted. 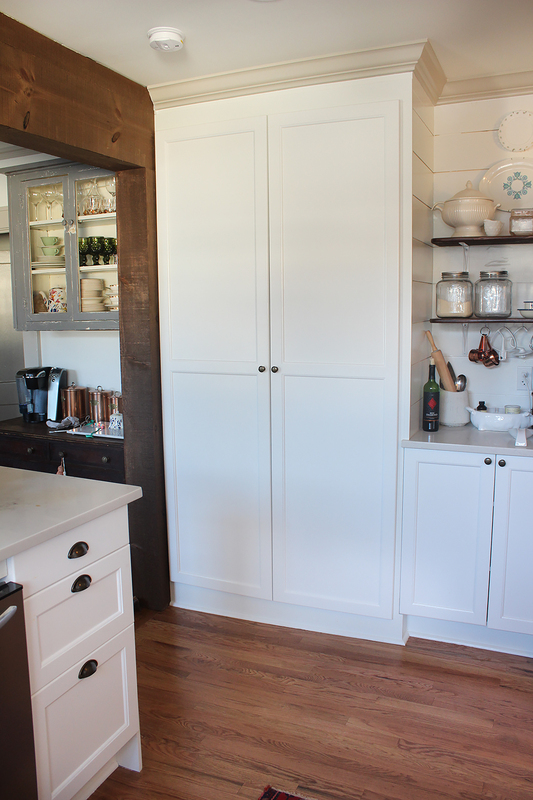 In our last kitchen, we hired a local cabinet maker to build custom wood cabinets. They built them, painted them, and came and installed them. And we couldn’t have been happier with them. While we loved them, we weren’t sure they were in the budget for this kitchen. The total for these two years ago when we did this kitchen were $6,000. While that kitchen was a good deal larger than our current one, we actually have a similar number of cabinets. So we weren’t sure the size of the room would save us very much. We got a quote just to see and it came in over $10,000. Not. in. the. budget. So we went back to the drawing board. We wanted the custom, built-in look that our last cabinets had, but we wanted a much cheaper option. We started looking at IKEA, but were concerned we wouldn’t be able to get the sizes we needed. That’s the nice thing about hiring a custom cabinet builder. 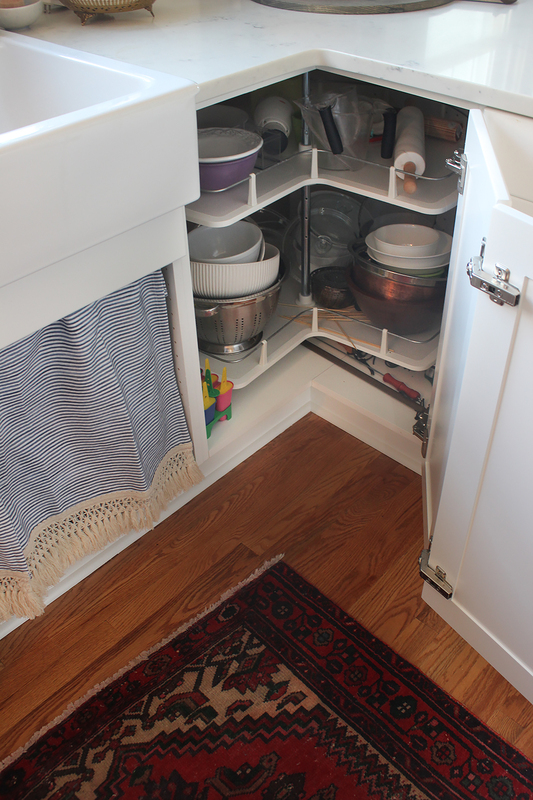 You can make the space perfectly planned and cabinet sizes can be adjusted down to the inch! I just didn’t see how we could make stock cabinets work in here. We wrote down our list of must-haves. We knew we wanted the stove centered on the back wall and the sink centered under the window. We started experimenting with cabinet sizes IKEA had to offer and were able to make it work! They do have spacers you can use to add inches where you need it, but ours ended up being a perfect fit! I couldn’t believe it. And once we found out that the cabinet pieces were sold separately, we had a plan. Chris knew a local cabinet door maker who makes custom wood doors. We purchased the IKEA cabinets with doors, gave him those doors to use as a template, and then returned them after! Obviously, he just looked at them to see sizing and where to place holes, etc. for attaching to the cabinet bases. They weren’t used or changed in any way. He has a huge variety of styles and we decided to go with Shaker like our last house, but with an extra ridge to make them more cleanable. We’re loving that change! After he made the doors, we returned the IKEA doors and his custom wood doors cost less than the IKEA laminate ones! Our all-in price for cabinets with new doors was $2,500! Quite a savings! To make them extra-sturdy and custom-looking, Chris built them up on a base instead of using the plastic feet that the cabinets come with. And then he wrapped the sides in shiplap, so they really have a unique feel! Another thing I liked about using IKEA interior cabinets was all of the inserts they have that fit their cabinets perfectly. The lazy susan in the corner cabinets is amazing! So much more functional than corner cabinets we’ve had in the past! The cabinets came unpainted and we had them painted the same color as the walls in the house, Benjamin Moore Chantilly Lace. We used Benjamin Moore Advanced paint and the finish is amazing! 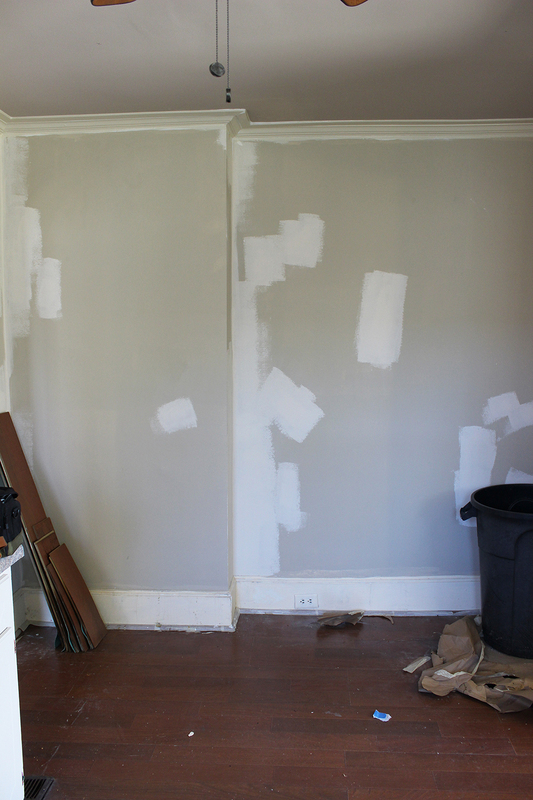 It’s a latex paint that dries slower like oil-based and has a harder, smoother finish. 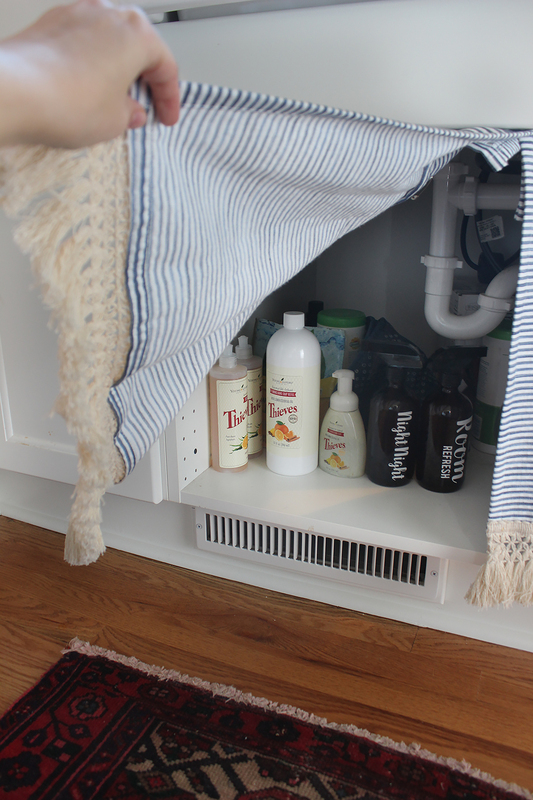 Another spot we found a huge way to save without compromising function was with the pantry. 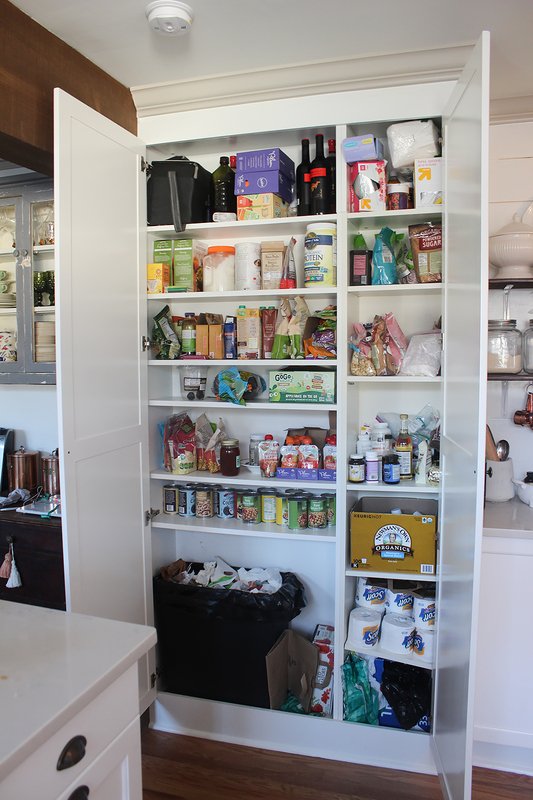 We envisioned a floor to ceiling, built-in pantry with lots of shelves inside. But that’s pricey to have built and we were on too much of a time crunch for Chris to add building that to his list. IKEA didn’t have a cabinet near tall enough to serve this purpose. 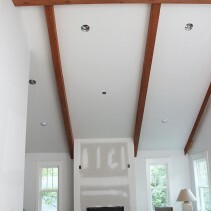 We also had work around the fireplace jut-out in this space that couldn’t be removed. We decided to use IKEA Billy Bookcases as the interior. We looked at the dimensions they come in and the 30″ and 15″ together would span what we needed here with the jut-out. We bought the extension so that the shelving units would be near ceiling height, close enough to then be built-in with trim. So this is made up of two different shelving units, a 30″ on the left and 15″ on the right. One thing I love about this set-up is that the shelves are totally customizeable, so I left a taller area free for a trash can. I hoped a can for recycling would fit in here as well, but it didn’t, so we keep one in the laundry area. Then, I left some shelves narrow for cans and was able to really maximize this space! I have more I want to do in here to organize it and maximize space and function, but it’s working well for now! 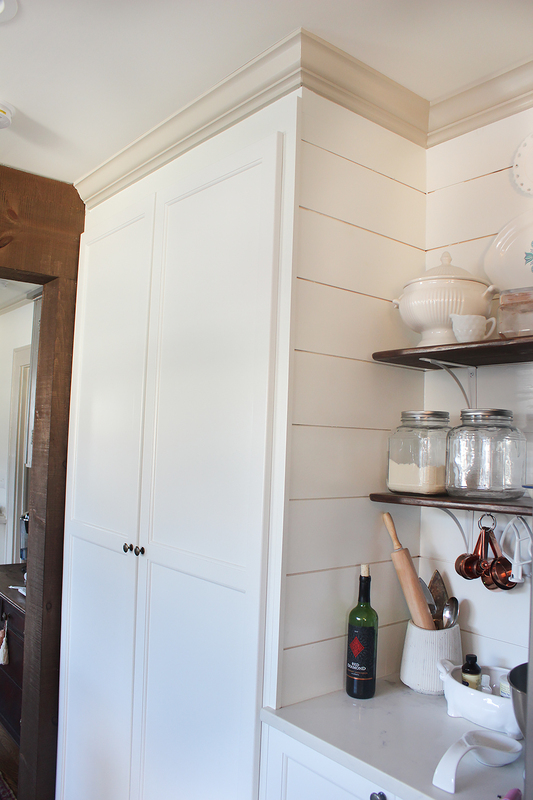 Chris took the shelving units and built them up and in at the top and bottom and wrapped the side in shiplap like the cabinets. So it really looks and feels like a custom, built-in cabinet! Our cabinet door maker built custom doors for this spot as well. We had a big walk-in pantry in our last house and I love this one so much more! It takes up a fraction of the space, was so reasonably priced, and it has even more function than that walk-in pantry did. There was so much wasted space! And the final thing I want to talk about is our skirted sink. I’ve always wanted one of these, but secretly wondered if I’d like it. And I love it! 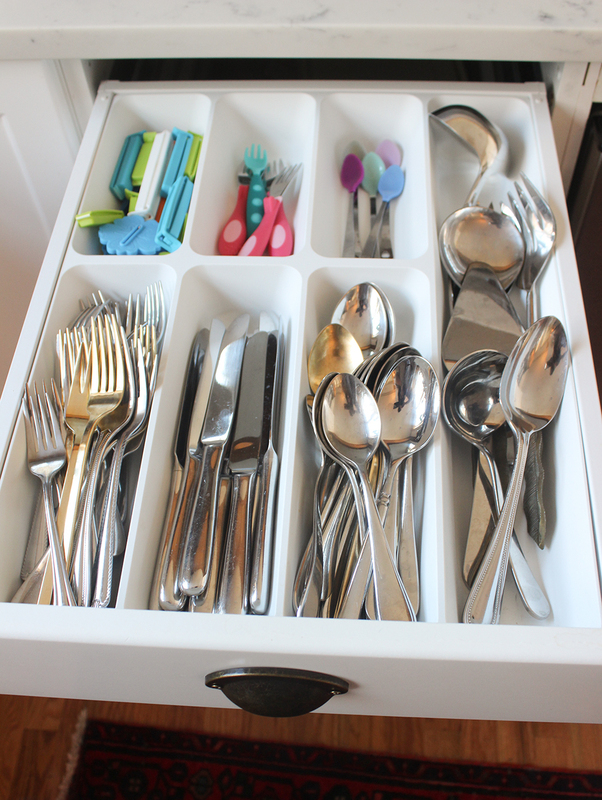 To create this, we bought the Domsjo sink cabinet that goes with the sink from IKEA. 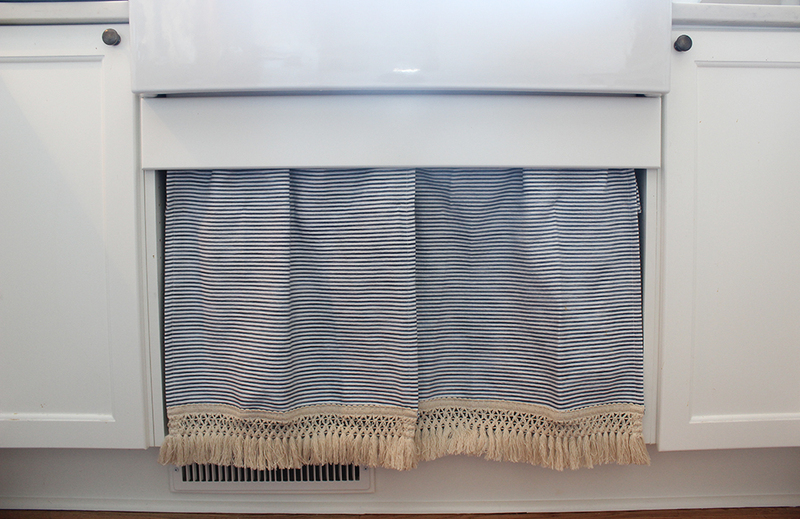 Then, we didn’t use the doors and our cabinet-maker made the thick trim piece to go under the sink and hide the rod. We used a small tension rod tucked up behind that piece and it’s been so sturdy and has worked great! I folded down the top part of the towels and used safety pins to secure them, which you can’t see at all! Then, I threaded the rod pocket through and hung it up! We keep our cleaning supplies and extra paper towels in here. We only keep natural cleaning products in the house, so there’s no concern with these being tucked behind a curtain. Update: I got a great question about natural products and them being potentially ingested…this is a whole post for another day, but the label “natural” doesn’t mean safe. I’ve done really extensive critical research about every product in our home. I’ve learned that the “natural” label is a super wide category and more research is required to make sure it’s safe! While I would never let my kids drink any of our cleaning stuff, if they ever did, the only recommended action is drink some water. They’re organic-grade, and made from only safe natural ingredients. I love that Rosie can help me clean our whole house with these and she gets so excited to join in the process! 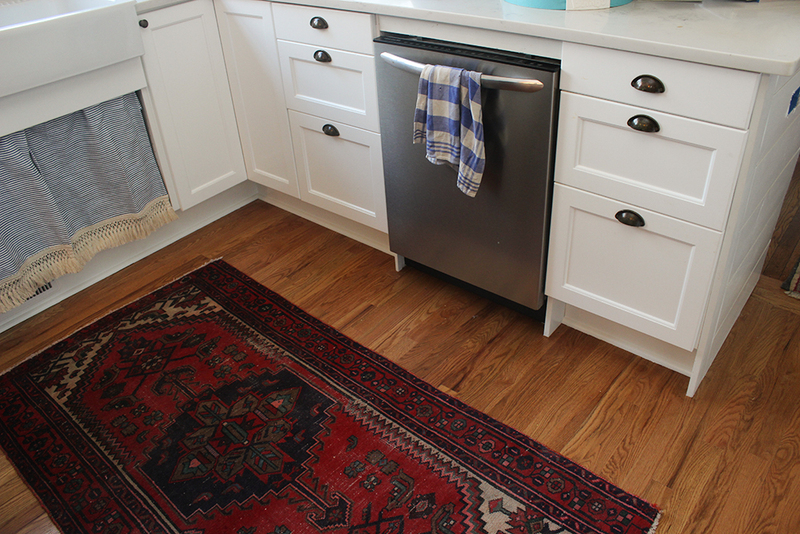 Alright, friends, there’s a little look at how we made this kitchen super functional and saved a ton! If you have any other questions about decisions made in this space, don’t hesitate to ask! This project was a fun one for us! I’m sorry but just because something is “natural” doesn’t mean that it’s safe if ingested. I’d be more cautious with those little blessings around. Thanks for this great post! I love ikea Cabinets and have used them successfully in rentals for years. Your bookcase hack for a pantry is genius too. 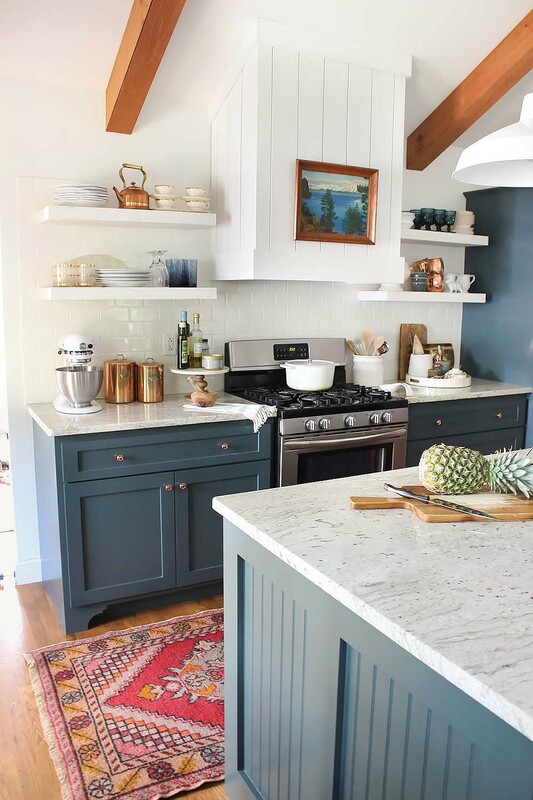 You have a lovely, workable kitchen without spending a fortune. Thanks so much, Gayle!! We’ve been really please with them too 🙂 And are definitely pleased with the price! What is the wallpaper design for kitchen? Love love love how this kitchen turned out. We’ve been considering Ikea cabinets as well. Would love to hear more details on how Chris built the bases! Thank you so much, Amber! He built a base structure with 2 x 4’s and screwed the cabinets onto that. It was a fairly difficult process for this kitchen because the floors in here were really uneven, so he had to level the cabinets with the bases! Once the cabinets were attached, he then attached the trim pieces you see around the base! I love a small kitchen and having everything accessible… and I love how efficient you’ve made this space. Using a bookcase for the pantry was an awesome idea. How exciting to discover that the less expensive kitchen is not only workable, but even more workable in some ways than your former house! I love the pantry, and covet it and your lazy susan corner cabinet. We have very old extra-deep kitchen cabinets, which hold a ton… and it seems like I’m always on my knees with my head all the way in a cabinet trying to reach whatever is at the very back! So that bookcase pantry idea looks wonderful to me. Just one question: do the bookcase shelves hold the weight of canned goods without bowing or bending? Thanks for all the good ideas. Thanks for your sweet words, Oona! We have had those super deep cabinets in previous kitchens too! And they were so hard to use all the storage! Yes, the bookcase shelves are super sturdy! That entire row of cans hasn’t made it bow at all! It’s worked great! Thanks so much, Katie! I’m so happy you’re here and always so good to meet another oil lover! I will definitely do a post on cleaning with oils! Had in one in mind already! I actually use Thieves cleaner for nearly everything – it cleans better than anything I’ve found and I love it’s immune boosting properties, so having it all over our house makes me happy. It cleans my shower and tile better than anything else! And while I love making my own recipes for things, I love when I don’t have to 🙂 But I do have a really simple heavy-duty recipe I use when nothing else will cut it. Will share soon!! Hi! 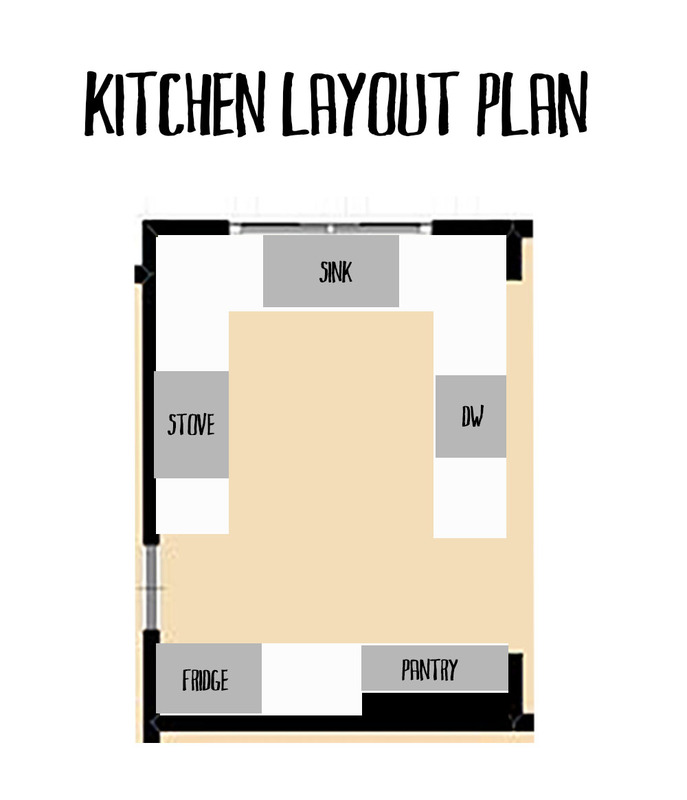 I keep commenting because my in-process kitchen is super-close in format and design to your new kitchen! It’s actually just the happiest coincidence that I’ve been following you for so many years and when I move into a new home to do a reno with a small u-shaped kitchen you happen to have just done the same! Anyway, I just got an estimate for my countertop installation and nearly fell off my chair! My setup is SUPER similar to yours and I imagine it’s almost the same square footage. I’d love to know how much you spent on installation and what is ‘normal’ for a job like this. My quote (without materials) was $2,900!!!! Is this normal? It’s about to be the most expensive thing in my kitchen! Any advice/insight is appreciated! 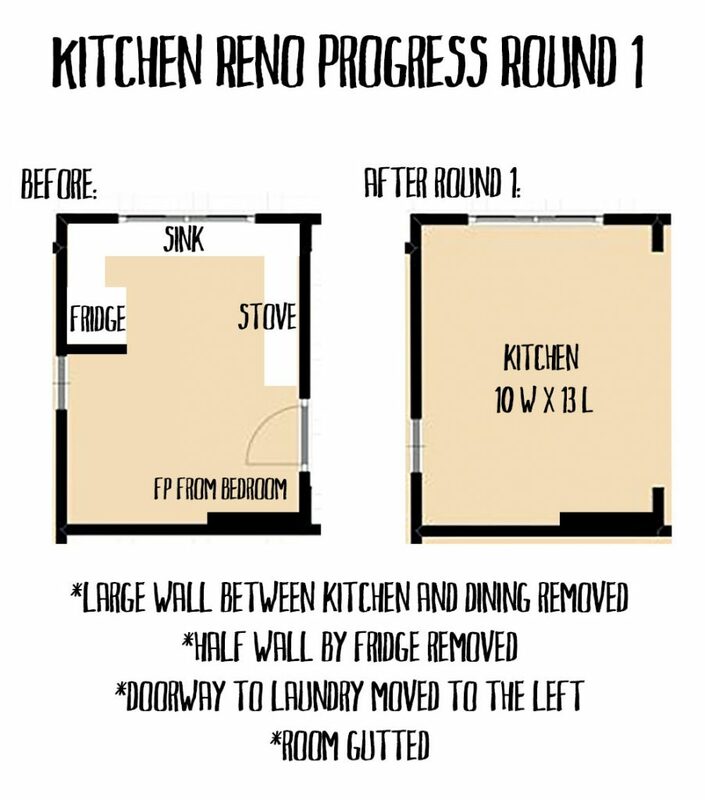 Once my kitchen is done I’ll send you a pic… you will laugh at how similar it is! Imitation is the highest form of flattery afterall! This is a show stopper ? Question for you: do you not use a microwave? I hardly ever see them in designers’ kitchens and wondered if y’all have a secret to quickly warming up leftovers? ? Oh I meant to put that in this post, Hannah! We do! We knew we wouldn’t have counter space for it in here, so it’s in our laundry room (the room right behind the kitchen). 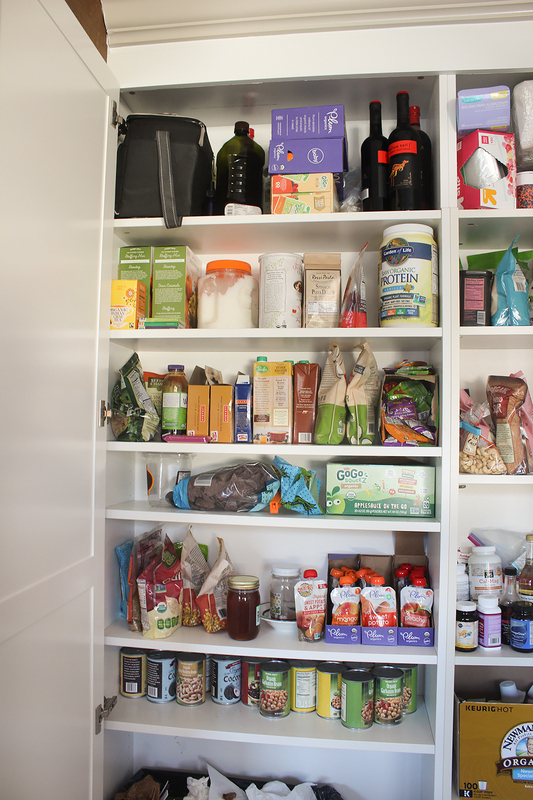 We had it in the pantry in our last house and I loved having it out of the way – they just take up so much room!!! To be honest, I want to wean ourselves off of it…I haven’t heard great things about them, health-wise, but need to learn more about that! Thank you so much, Jenny! It is vented outside! It goes through the kitchen ceiling and out the attic vs. out the wall behind it – does that make sense? We did just build the hood around it. We had a recirculating one in our last house and built a hood around it and had some issues with it and had to actually have it vented out before we moved. But I know a lot of people do that and do not have an issue! I’m crushing so hard on your range hood!!! Agh! 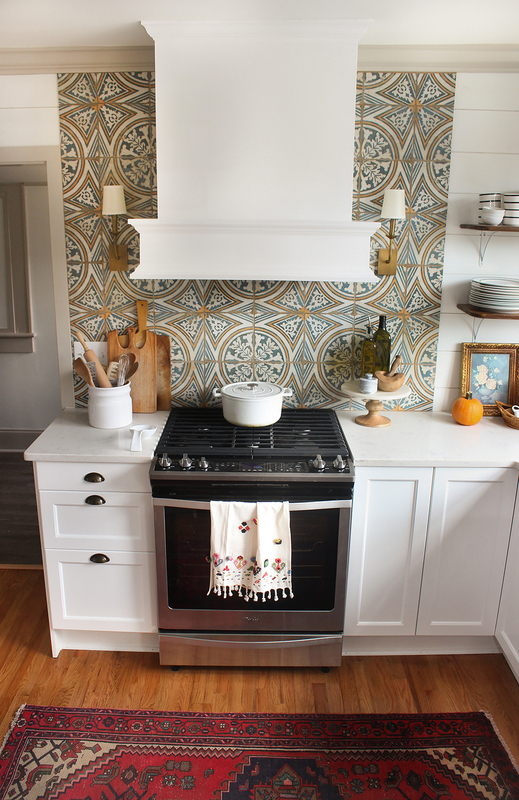 I’ve been sifting through blog feeds and Pinterest for months to find the perfect inspiration for a range hood and literally stared at your kitchen reveal post for a half hour when I saw yours. Did you build this yourself? If so, could you share any specs about it (type of wood and molding used, a sketch with dimensions, etc. )?